A gorgeous 3 Bedroom/2 Bath Bayfront Condo with a Pool! Triton`s Trumpet 105A is a gorgeous Bayfront Condo in OCMD that sleeps 6. Triton`s Trumpet 105A could not be a more perfect setting for your next OCMD Getaway. Take in captivating Sunsets right in your Bay View Backyard. Conveniently located on the 1st Floor with a fabulous Wraparound Water View Terrace. Newly Renovated and beautifully decorated with a Nautical Flair. Relax with Free WiFi, Cable TV, and gorgeous Bay Views after a fun-filled day on the Beach. Dine in the comfort of Central AC or catch Bay Breezes and dine Al Fresco on the huge Terrace. Colors of Sea Glass with Nautical Reds are relaxing & refreshing. The well-stocked Kitchen will delight the Chef in your family. Everything you need to make mealtime a bay breeze..... Fabulous Master Bedroom with King Bed & access to the Bay View Terrace. Triton`s Trumpet 105A had been lovingly renovated and cared for. Beachy Blue adorns the Master Bath with Solid Surface Vanity & Tub/Shower Combo. Down the hall, Bedroom 2 has a comfy Full Bed with Twin Trundle & colors of Sand & Sea. Bedroom 3 also has a Queen Bed & Sunny Yellow Walls. Bright & cheerful throughout, this is the place to be in OCMD. A 2nd Full Bath with Tub/Shower Combo is shared by Bedrooms 2 and 3. No waiting in line to shower with 2 Full Baths. Beautiful in the Summer and even in the Fall..... Unwind on the Terrace and share stories of the day`s adventures. It doesn`t get much more relaxing than this..... Wow..... You will love the fabulous Outdoor Pool with Hot Tub. Lovely backyard overlooks the Bay and THE best Sunsets to be found. Watch Herons & Egrets fish for their morning meal as you watch from the Terrace. Huge Furnished Wraparound Terrace is the perfect place to begin and end every day. Take in the Colors of Fall in the Off-Season. Just imagine enjoying your morning coffee right here before hitting the Beach. The Terrace is fully furnished in-season - you`ll never want to leave. Triton`s Trumpet is located in the heart of Ocean City on 79th Street. This fabulous Condo has a wonderful Outdoor Pool, as well. Nothing but beautiful Views of Water and Wildlife. OCMD boasts some of the cleanest, most beautiful beaches on the East Coast. Life is so busy - jobs, school, activities.....it's hard to squeeze in time with those who matter most. Clear the calendar, grab those you love, and head to OCMD for a Beach Getaway. Trition's Trumpet 105A, or Sandy Bottoms as the Owners lovingly call it, is the perfect homebase for your Vacation Adventures. Located in the heart of Ocean City on 79th Street, you're close to everywhere you want to be, but feel a million miles away from the real world. Tucked back on the Assawoman Bay, you'll enjoy lots of privacy, and Sunsets that will take your breath away. With a Community Pool and just a short stroll to the 80th Street Beach Access, Shops, and Dining, you really can have it all - and at a very Family-Friendly Price Tag! This gorgeous Condo sleeps 6 in comfort & style, and is decorated with a fun & tasteful Coastal Flair. No stairs to climb makes for easy loading & unloading, and the wonderful Outdoor Pool is just around the corner. As you enter, you'll love the Custom Tile Floors - fresh, clean, and easy-breezy. As you get to the end of the Hall, you'll be met with a fabulous Open Floor Plan and breathtaking Views of the Bay. 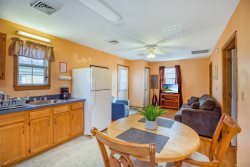 The Living Area is light and bright with Nautical Red & Beachy Blue, oversized Comfy Furniture, Flat Screen Cable TV, and Free WiFI - a great place to relax after a fun-filled day on the Beach. With a Wall of Windows facing the water, you can't get away from amazing Views. These windows lead to the huge Wraparound Terrace direclty facing the Bay and gorgeous Sunsets. End the day here with a glass of Pinot while watching the Sun sink into the Bay. Beautifully furnished on all sides, there are several comfy places to curl up with a good book, as well. The Chef in the Family will love the Well-Stocked Kitchen with everything you need to make mealtime super easy. Grab a quick bite at the Breakfast Bar before exploring OC, or dine at the table with the family - we just love the Retro Flair that the Dining Area boasts. You can also dine Al Fresco while watching the Herons & Egrets in the Bay. Not one to cook on Vacation? No worries - many great Dining options are a short stroll away including a Local's favorite, Hooked, and The Ropewalk. Doesn't get much better than this, right? Oh, but it does! The spacious Master Bedroom has a comfy King Bed, Private Master Bath, and access to the peaceful Waterfront Terrace. Adorned in sophisticated Pale Grays and cool Coastal Whites, you will wake in the morning to lovely Water Views. Grab your morning coffee and sneak out there while everyone else still slumbers - such a peaceful time of day on the water. In the Master Bath, you'll find a Tub/Shower Combo and Solid Surface Vanity. On the other side of Sandy Bottoms, there are 2 more spacious Bedrooms and another Full Bath. Bedroom 2 features a Full Bed with Twin Trundle, and Colors of Sand & Sea Glass. There is also a Flat Screen TV for your enjoyment. Bedroom 3, right next door, also has a Queen Bed and Coastal Colors. The spacious 2nd Full Bath also has a Tub/Shower Combo and Solid Surface Vanity. Triton's Trumpet 105A has been lovingly renovated & cared for by its Owners. No stone has been left unturned to ensure that your next Ocean City Vacation will be wonderfully fun & relaxing. Isn't it time you had a Vacation that makes you forget to check your cell phone?